Background: The increasing use of nanoparticles (NPs) may have negative impacts on both organisms andthe environment. Objectives: The differential expression of mitochondrial manganese superoxide dismutase (MnSOD) gene in wheat in response to silver nitrate nanoparticles (AgNPs) and AgNO3 was investigated. Materials and Methods: A quantitative Real-Time RT-PCR experiment was carried out with MnSOD gene using RNAs isolated from wheat shoots treated for 0, 2, 6, 12, and 24 h with 100 mg.L-1 of either AgNO3 or AgNPs. Results: The results of this study showed that both treatments cause changes in the expression pattern of the MnSOD gene. While 2 and 6 h following the beginning of the stress, MnSOD expression was up-regulated significantly, in response to AgNO3 (1.4 and 2.8 fold, respectively), in response to AgNPs, it was up-regulated significant only after 6 h (1.6 fold), compared with the control. The gene expression, after 12 h in response to AgNO3 and AgNPs were down-regulated significantly (0.7 and 0.8 fold, respectively), and in the next 12 h , the expression appeared to be similar to the control. Conclusion: Exposure to both AgNPs and Ag ions led to a signiﬁcant increase in MnSOD expression, but AgNO3 changed the MnSOD expression faster than AgNPs. Therefore, it is suggested that AgNO3 has greater penetrability and effectiveness. Today, nanoparticles, because of their unusual, novel, and improved properties, are applied in all aspects of life. In recent years, design, production, optimization, and application of synthesized nanoparticles in different areas and mode of functions are very attractive (1, 2). The growing production of nanoparticles has led to concerns over the adverse impacts on the environment (3, 4). Based on literature there is no full understanding of the potential for health or environmental risks on nanoparticles (5). The effects of metal nanoparticles on plant germination and growth with focus on crop yield have been reported elsewhere (6-10). In contrast, possible side effects of the use of silver nanoparticles and silver ions on plant growth has received little attention (11-14). Both silver nanoparticles (AgNPs) and ions (AgNO3) have been negative cellular and molecular effects on plants such as interaction with the cell wall and cell membrane, leading to changes in membrane permeability, impairing proton motive force and inhibition of the ATP synthesis, interactions with amino acids and inhibition of enzyme activity by binding to sulfhydil groups (-SH) of amino acids and their active center; inhibition of electron movement in the respiratory chain and cytochromes; deregulation of DNA and RNA synthesis; denaturing the ribosome and inhibiting protein synthesis; and generation of reactive oxygen species (ROS) (8, 15-17). In plants, reactive oxygen species (ROS) are produced and scavenged in both stressed and unstressed conditions. In non-stressed condition the production and recycling the ROS appears to be in balance, while in stressed condition the production supersedes the scavenging and therefore the cascades of cellular and molecular damages will be rolled over throughought the organism (18). Under these stress, with high concentration of ROS, an effective scavenging system is required to avoid oxidative damage to plants (18). Superoxide dismutase (SOD) enzyme has been reported to serve as an environmental toxicological stress marker, which plays a determinant role in plant protection against the toxic effects of oxidative stress by scavenging superoxide radicals. SOD catalyzes the conversion of O2− into H2O2, which can reduce the amounts of damaging ROS produced by the adverse environments, and alleviate the harm to plants (19-21). In plants, multiple SOD isozymes exist, which are classified into three types based on their metal co-factors: Cu/ZnSOD, FeSOD and MnSOD (18). To the best of our knowledge, limited investigations have been conducted to study the effects of NPs on plant gene expression. The release of NPs in the environment has increased concerns about their effects on living organisms, including higher plants (22, 23). Here, the changes of MnSOD were studied in wheat exposed to both AgNPs and AgNO3 via Real-Time PCR. Wheat seeds (Triticum aestivum L. Var. Chamran) were obtained from Zarghan Agricultural Research Center, Iran and kept in the dark at 4 °C before use. Seeds were surface sterilized by soaking in 5% (w/v) sodium hypochlorite for 10 min. They were washed three times with distilled water and air-dried on filter papers. Seeds were allowed to germinate in dark at 25 °C on moist filter papers. Five-day old seedlings (20) were transferred into small plastic containers filled with perlite and Hoagland nutrient solution (pH 6.2). Wheat seedlings were grown in growth chamber set at 16 h/8 h light-dark periods. Three biological and technical replicates were used. Control and treated wheat seedlings were immediately frozen in liquid nitrogen and stored at -80 °C until nucleic acid extraction. AgNPs with average sizes of 20 nm and 99.99% purity was purchased from US Research Nanomaterials, lnc. (USA). AgNO3 (99.9%) was obtained from Sigma-Aldrich (Sigma-Aldrich-209139, Germany). Using Hoagland nutrient solution as solvent, two concentrations (10 and 100 mg.L-1) of both silver particles were prepared. The dissolved particles were dispersed by a high-power probe-type Sonicator (Misonix, Qsonica LLC, Newton, USA) for 30 min. For the control only the Hoagland nutrient solution was used. After 2, 6, 12 and 24 h of treatment, the leaves of wheat were harvested and were stored at -80 ºC until RNA extraction. Total RNA was extracted using an RNA isolation kit (DENA Zist kit, Iran) according to the manufacturer’s instructions. Extracted RNA was kept in -80 °C until DNaseI treatment (Fermentas, Hanover, MD). Extracted RNA was quantified using Nano-Drop ND 1000 Spectrophotometer (Wilmington, USA). Actin (accession numbers: ‎GQ339780 and KC775782) and 18s rRNA (accession number: K01229) primers (Table 1) were used to check for any DNA contamination. First strand cDNA was synthesized using reverse transcriptase (Fermentas, Hanover, MD). primers (Table 1) were designed at Allele ID 7.8 software according to the relevant wheat sequences (accession numbers: KC158224, AY963808, KP313757) to amplify 105 fragment. The wheat Actin and 18s rRNA genes were used as the reference genes (24) for data normalization via geometric mean. PCR products after preparation were sequenced in Macrogen. Sequence homology searches were carried out using the Basic Local Alignment Search Tool (BLAST) facility available at NCBI. Real-Time RT-PCR reactions were performed using a SYBR Green kit (Takara, Japan) according to the manufacturer’s protocol. The first strand cDNA were diluted 5X with RNase-free water. Quantitative PCR was performed in 20 μL reactions using gene specific primers(A final primer concentration of 0.4 μM is recommended in most reactions), 4 μL of cDNA as a template. The abundance of targeted gene transcripts was normalized to Actin and 18s rRNA and set relative to control plants according to the 2-ΔΔCT method (25). For quantitative Real-Time RT-PCR data, relative expressions were calculated based on the threshold cycle (CT) method. Experiment was conducted in the frame of randomized complete block design and each value reported was the average of three replicates. The raw data were imported into Microsoft Excel 2007 and GraphPad Prism 5 programs for calculations and graphic representation. SPSS (version 16.0) software was used for the analysis of variance. Quantitative changes of parameters were evaluated through analysis of variance (two-way ANOVA), with Duncan’s multiple range tests at p ≤ 0.05 to find out significant differences among treatments. All results are presented as the means ± standard deviation (SD). Real-Time RT-PCR was performed to investigate the MnSOD expression in response to AgNPs and AgNO3. The results showed that the MnSOD was significantly up-regulated at 2 and 6 h (1.3 and 2.8 fold change, respectively) and then down-regulated at 12 h (0.5 fold) after AgNO3 treatment (Table 2 and Fig. 1). Twenty four hours after AgNO3 treatment, the expression of MnSOD remained unchanged. In response to AgNPs, MnSOD expression increased at 6 h (1.6 fold) and down-regulated at 12 h (0.8 fold) compared with non-treated wheat seedling at the same times. At 2 and 24 h after AgNPs treatment, there were no significant changes as compared to the control. MnSOD expression was gradually increased at 2 h after treatment, and reached to its maximum level at 6 h post treatment, in response to both AgNO3 and AgNPs. The MnSOD expression was decreased slightly at 12 h of post-treatment and reached to the control level, during next 12 h. Results showed that MnSOD gets up-regulated early in response to silver in two forms of ions and nanoparticles. ﬀect was weaker than that of silver ion, consistent with earlier reports (11-14). In response to AgNO3, at 2 h of post-treatment, expression of MnSOD was up-regulated. Whersas in response to silver nanoparticle it was up-regulated 6h after treatment. These data provided further evidences that the effects of AgNPs are not simply due to the release of Ag ions. These studies have led to new insights into the changes of MnSOD expression of wheat responses to AgNPs and AgNO3. Plants have an antioxidant protection system to keep away from ROS formation, and this protection system includes a range of antioxidant enzymes such as SOD; something that we can implement as the biomarker of the oxidative stress to analyze cellular homeostasis (26, 27). Our results suggest that wheat seedlings might develop strategies to cope with AgNO3 and AgNPs toxicity by manipulating the expression level of SOD genes. Exposure to both AgNPs and Ag ions led to a signiﬁcant increase in MnSOD expression, but AgNO3 changed the MnSOD expression faster than AgNPs. Therefore, it is suggested that AgNO3 has greater penetrability and effectiveness. These findings suggest that the MnSOD expression can be considered as a marker for evaluation of the heavy metals and metal nanoparticles effects on the cellular processes. To better understand of AgNO3 and AgNPs toxicity on plant, additional researches in other genes that are important in this regard, should be carried out. 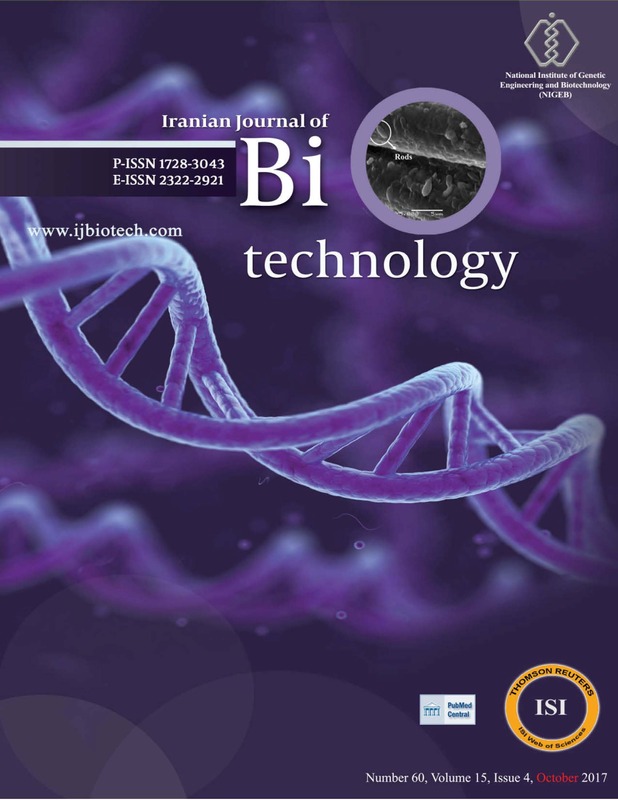 The authors thank the Biology Department and Institute of Biotechnology of the Shiraz University for Supporting of this work. Kaegi R, Voegelin A, Sinnet B, Zuleeg S, Hagendorfer H, Burkhardt M, et al. Behavior of metallic silver nanoparticles in a pilot wastewater treatment plant. Environ Sci Technol. 2011;45(9):3902-8. DOI: 10.1021/es10418922019. Livak KJ, Schmittgen TD. Analysis of Relative Gene Expression Data Using Real-Time Quantitative PCR and the Method. Methods. 2001;25(4):402-8.